Background: Diabetes mellitus (DM) is a chronic illness with prevalence of 171 million worldwide; as a result, most of body organs and particularly the eye sensitive tissues are affected. Recently, diabetes was termed as one of the main causes of blindness. There are about 126 million people worldwide affected by diabetic retinopathy (DR) with 37 million patients suffering vision-threatening DR. However, most of the people are unaware of ocular complication due to long-term DM. Research Methodology: This was a cross-sectional hospital-based study included 309 participants' ages 15 years and above who attended Makkah Eye Complex. A standardized pretested and precoded questionnaire was used for collecting the required data. The study was ethically approved from the Institutional Review Board of Al-Neelain University and Khartoum State Ministry of Health, with the permission of Makkah Research Center. Results: Regarding awareness about which part of the eye affected by DR, 46.6% of the participants stated the retina while 40.1% (124) mentioned that they did not know. Regarding awareness about the treatment of DR, 39.91% of the participants mentioned medication, 25.82% of them mentioned surgery, while 23.47% said by laser. The source of knowledge among participants was found to be as follows: 36.2% from media, 18.1% from friends and relatives, while 17.8% from physicians, general practitioners, and ophthalmologists. Conclusion: The number of DM patients who received advice (at the point of disease detection) from doctors or medical personnel to see an ophthalmologist was a minority although it is a very valuable advice since delayed detection of retinopathy leads to serious outcomes and complicates the management. Awareness program and counseling for diabetic patients toward the fact that DR is a manageable disorder if intervention took place in time. Diabetic retinopathy (DR) is a serious, irreversible eye disease that can occur in people with diabetes and is the leading cause of blindness around the world. Patients are often unaware of the seriousness of DR, as well as assessment and management of DR patients. High prevalence increase of DR appears to be greater in developing countries. The etiology of this increase involves changes in diet, with higher fat intake, sedentary lifestyle changes, and decreased physical activity. An increasing prevalence of diabetes is occurring throughout the world. The patients' ages at the onset of diabetes ranged from 20 to 72 years, with the majority of patients (44%) developing diabetes at the age between 40 and 50 years. Female-to-male ratio was 1.9:1. About 46.2% of patients were obese, and a family history of first-degree relatives was obtained in 63% of patients. Among persons with diabetes mellitus (DM), the prevalence of DR did not vary substantially by age group or gender, and their pattern was inconsistent. However, the general population prevalence of DR clearly increased with age. It is known that a substantial number of persons with DM are unaware that they have DM and that such persons may have DR. Patients with DR have more negative beliefs about diabetes than those without retinopathy, and we identified strong and consistent associations between negative beliefs and psychological outcomes regardless of the presence of other diabetic complications. Communication approaches are considering people vary widely in their socioeconomic conditions, traditions, attitudes, belief, and level of knowledge that uniform communication approach may not be viable. Its primary goal is to create awareness of the problem in those whom it reaches and to begin to increase their level of knowledge. Mass media, such as television, newspapers, and the radio, can be effectively used to increase the level of knowledge in the community about DM and DR. Posters displayed in hospitals or public meeting places have the same advantages of being widely seen but also carry a disadvantage. Since most of the targeted population may be illiterate or visually impaired and poster message may not be clearly transmitted, it is designed to help change the opinions and attitudes of the targeted population. The aim of the study is to assess the common sources of awareness regarding DR among Sudanese adult diabetic patients. Early detection of DM and DR leads to significant reduction in progression of DR by early treatment with laser photocoagulation. Is an increased knowledge of diabetic eye diseases related to reduction in DR complications? This was a cross-sectional hospital-based study conducted in consented 309 adult Sudanese diabetic patients of 15 years old and above, who attended Makkah Eye Complex as part of Al-Basar International Foundation, Khartoum, Sudan. A standardized administered pretested and precoded questionnaire was used for collecting the required data, from August 16, 2014, to December 2, 2014. The study was ethically approved by the Institutional Review Board of Al-Neelain University and Makkah Research Center. 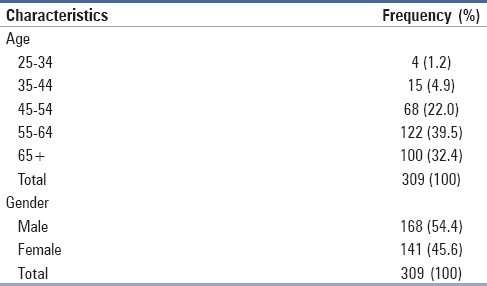 Data were analyzed using IBM SPSS Inc. PASW Statistics for Windows, Version 18.0; 2009. Chicago: SPSS Inc. It was noticed that 39.5% (122) of participants fall within the age group (55–64) and 32.4% (100) fall within the age group (45–54). The average age was found to be 59.6 years. It was noticed that males constituted 54% (168) of the total number of the participants [Table 1]. 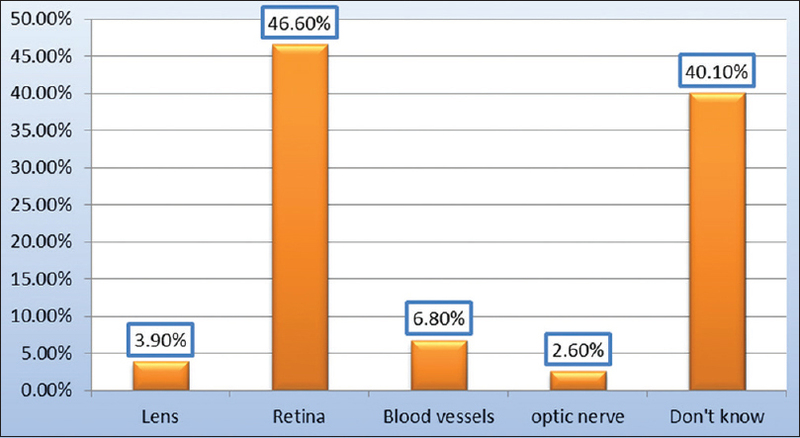 Regarding awareness about which part of the eye affected by DR, 46.6% (144) of the participants said the retina while 40.1% (124) said that they do not know [Figure 1]. Source of knowledge among participants was found to be 30.9% and 30.5% for proliferative DR (PDR) and clinically significant macular edema (CSME), respectively [Table 2]. 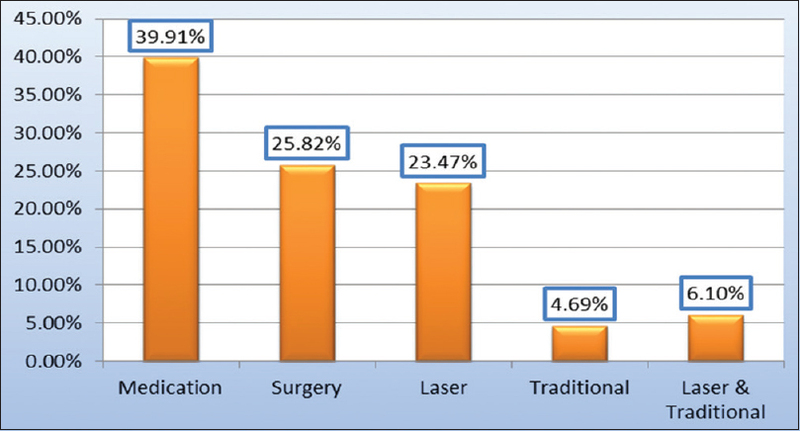 Awareness about the treatment of DR, 39.91% (85) of the participants said by medication, 25.82% (55) mentioned by surgery, while 23.47% (50) said by laser [Figure 2]. About 62.5% (193) of the patients said that we cannot prevent blindness once the eye affected by DR [Table 3]. When the participants asked about their awareness regarding risk factors of DR, 51.5% (159) of participants said that they are aware while 48.5% (150) said that they are unaware [Figure 3]. Source of awareness among participants found to be 36.2% (112) from media, 18.1% (56) from friends and relatives, while 17.8% (55) from physicians, general practitioners, and ophthalmologists [Figure 4]. Half of the participants were found to be aware of the basic DM ocular complications. The source of their knowledge was mainly from media, friends, and relatives which shows the absence of national awareness programs beside the week role of primary eye health care. While high proportion of participants (40.1%) do not know which part of the eye is mainly affected by DM, 50% of them are aware regarding the risk factors of developing DR; half of the patients believe in that whenever the eye affected by DR blindness is a definite fate and no management or intervention will help. These facts indicate deficiency in counseling process ought to be conducted by ophthalmologists, paramedics, or eye care health workers since they are the main eye care education and awareness providers; they are missing a precious chance because the audience are the DR patients, will carefully receive the health educational message, and may convey it to other patients and community members. The study showed that the number of DM patients who received an advice (at the point of disease detection) from doctors or medical personnel to see an ophthalmologist was few although this is a very valuable advice since delayed detection of retinopathy leads to irreversible complications. From the study, it was found among all types of DR patients, the majority believe that blindness is the fate of retinopathy regardless of proper follow-up and treatment, and this is due to traditional beliefs and lack of sophisticated ophthalmic services in the past since they witnessed many cases of blindness among diabetic patients. The study showed poor awareness about ocular diabetic complications and DR, most of the participants furnished with knowledge about DM and DR through media and relatives, and it is clearly recognized that no definite awareness strategies was adopted. 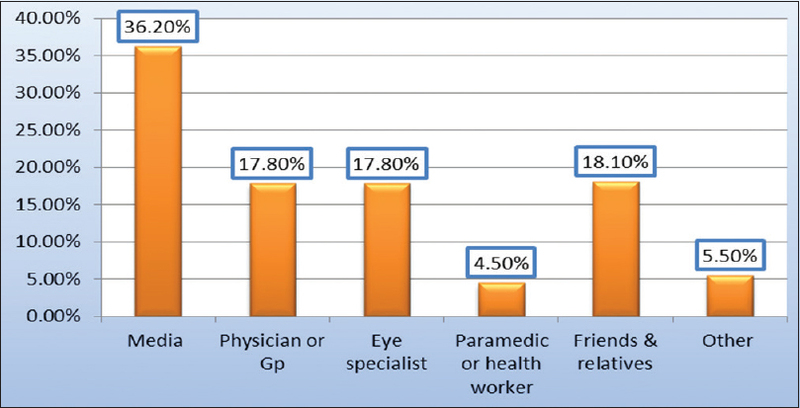 The role of general practitioners and paramedics is not tangible since they represent 17.5% and 4.5%, respectively, indicating a defect in awareness program and policy since these are the pillars of health education among the community as mentioned by Kaliyaperumal regarding communication approaches. Among all participants, media were the main source of knowledge, and amazingly, physicians, paramedics, and health workers were the least contributors in conveying knowledge, beside that the level of knowledge is far greater in advanced retinopathy (PDR and CSME) patients, indicating that their knowledge acquired by repeated visits to ophthalmic facilities [Table 2]. The advanced DR patients are more knowledgeable, indicating that awareness programs are not sufficient, knowledge acquired by repeated visits rather than the efficiency of the awareness programs. The role of medical cadre in awareness is the least among other sources pointing to the fact that the health system is not addressing awareness properly. Few of the Sudanese Adult Diabetic Patients at Makkah Eye Complex-Khartoum, Sudan, 2014 who received advice earlier at the time of the diagnoses of Diabetes Mellitus were found to be aware of the basic diabetes mellitus ocular complications. The main source of their knowledge was mainly from media, friends and relatives. There no well-designed heath educational and counselling national programs so many patients believe in that whenever the eye affected by Diabetic Retinopathy blindness is a definite fate and no management will help. National Awareness and counselling programs for diabetic patients toward the fact that DR is a manageable disorder if intervention took place in time is very effective. Chronic Diseases and Medical Innovation in an Aging Nation. Available from: http://www.silverbook.org/DR. [Cited on 2016 Jul 14]. Williams R, Airey M, Baxter H, Forrester J, Kennedy-Martin T, Girach A, et al. Epidemiology of diabetic retinopathy and macular oedema: A systematic review. Eye (Lond) 2004;18:963-83. Bhavsar AR, Emerson GG, Emerson MV, Browning DJ. Epidemiology of diabetic retinopathy. In: Browning DJ, editor. Diabetic Retinopathy. New York: Springer; 2010. Elmahdi EM, Kaballo AM, Mukhtar EA. Features of non-insulin-dependent diabetes mellitus (NIDDM) in the Sudan. Diabetes Res Clin Pract 1991;11:59-63. Kahn HA, Moorhead HB. Statistics on Blindness in the Model Reporting Area, 1969-1970. NIH Publication No. 73-427. Washington, DC: National Eye Institute, Superintendent of Documents, US Government Printing Office; 1973. Kempen JH, O'Colmain BJ, Leske MC, Haffner SM, Klein R, Moss SE, et al. The Wisconsin age-related maculopathy grading system. Arch Ophthalmol 2004;122:552-63. Rees G, Sasongko MB, Fenwick EK, Nicolaou TE, Wong TY, Lamoureux EL. Impact of diabetic retinopathy on patients' beliefs about diabetes. Clin Exp Optom 2012;95:371-6. Kaliyaperumal K. Guideline for Conducting a Knowledge, Attitude and Practice (KAP) Study. J Community Ophthalmol; IV,2004;p8-9.